Consider my earlier post that archaeologists are determining that there may be around 100,000 years of unrecorded human history. Much of that would have been primitive; but it is wrong to assume that these eras lacked thinkers and artists. Certainly some of the lost literature was deliberately and systematically destroyed. A quite unhistorical, but probably apt, story comes to us through the Norwegian humorist, Nils Kjaer. At the time of Caliph Omar's invasion of Egypt, the Arab officer on duty in the destruction of the library of Alexandria used two stamps with which he marked the books. One said: "Does not agree with the Koran--heretic, must be burned.The other said: Agrees with the Koran--superfluous, must be burned. Earthquakes and floods in the Middle Ages submerged the library's site under water, so that archaeologists cannot identify precisely what happened there. The Great Library of Alexandria by O. Von Corven (19th century: an artistic rendering based on some archaeological evidence). Image Source: Wiki. What we know of early human knowledge comes from surviving bits of tablets and scrolls from several ancient libraries, from archaeological sites, and above all from copies of copies, preserved through the Middle Ages. Aside from Alexandria's collection, significant portions of other libraries' holdings were lost. 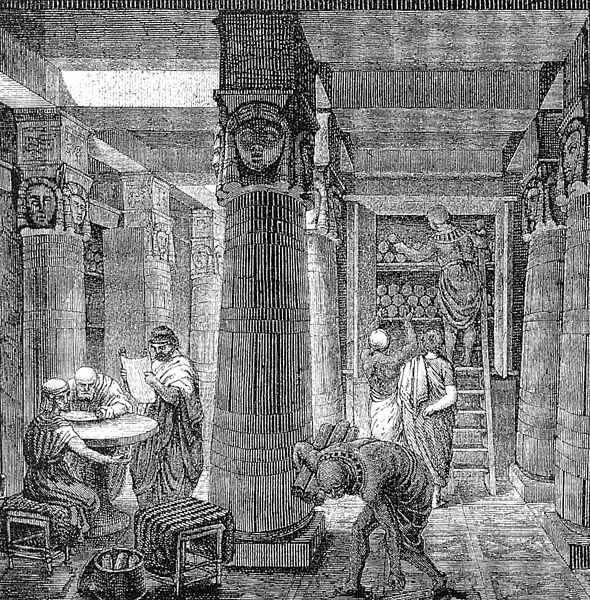 For example, the library of Pergamum's collection was compromised when Mark Antony gave Cleopatra all of Pergamum's 200,000 volumes to the library of Alexandria as a wedding present in the mid-30s BCE (this account conflicts with the theory that Caesar had already burned down the library at Alexandria); and those texts were subsequently lost in the Alexandrian fire. Thus, the last great repository of early knowledge was situated in Byzantium, in the old Eastern Roman Empire, forerunner to the lands divided by Habsburgs and Ottomans. The capital of the Byzantine Empire, Constantinople (now Istanbul), featured a library which held the collected writings of the ancient world. Founded by Constantius II (reigned 337-361 CE), the Imperial Library at Constantinople copied and preserved information for 1,000 years, after all its predecessor libraries had been destroyed. In a time when our computers are rendered obsolete every 18 months or so, a 1,000 year span of data preservation is worth contemplating. 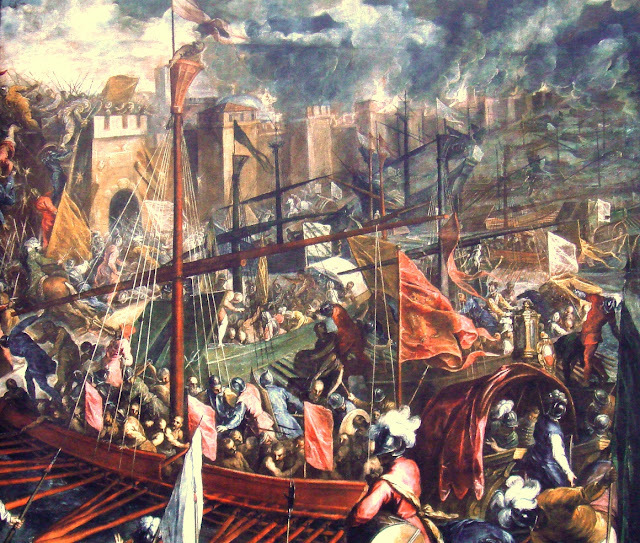 Siege and plunder of Constantinople, 1204, Fourth Crusade. Video Source: Youtube. 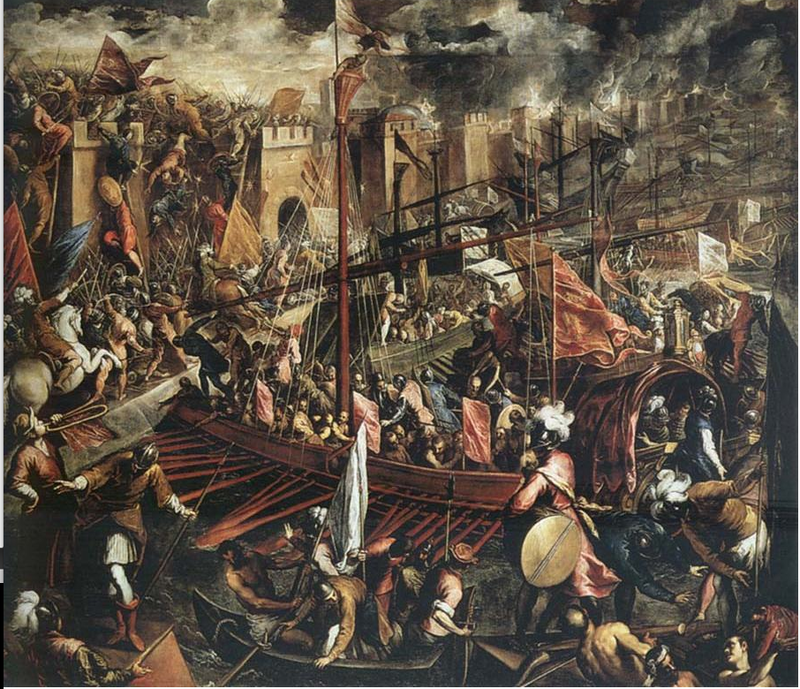 The library at Constantinople was damaged and finally obliterated in three separate fires: in 473 CE, a fire destroyed 120,000 volumes, although some damaged works were recopied and hence have come down to us; in 1204, the knights of the Fourth Crusade destroyed a large portion of the library's holdings (see video above); then in 1453, the forces of Mehmed II, Sultan of the Ottoman Turks, captured Constantinople and destroyed the library completely. Whilst there were many reports of surviving texts into the Ottoman era, no substantive portion of the library's has ever been recovered. Professor Carlyle was provided access in 1800 to the Seraglio, the supposed repository of post-Ottoman conquest surviving texts, but no texts from the Imperial Library were located. A notable exception is the Archimedes Palimpsest, that surfaced in 1840, was translated in 1915 and was unaccountably found in a private collection and sold in 1998. The Archimedes Palimpsest is a 10th century codex, a hand-written bound book prepared prior to the invention of printed type. It is also a palimpsest, meaning it has several texts written on top of each other, which have never been seen anywhere else. It includes copies of much earlier mathematical treatises by Archimedes (c. 287 BCE–c. 212 BCE) (listed here), which were overwritten with religious texts in the 13th century. Other texts have later come to light with enhanced imaging techniques. In the 1840s, a biblical scholar, Constantin von Tischendorf, tracked the codex down in Constantinople and brought home a page from the book, which is now in Cambridge University's Library. 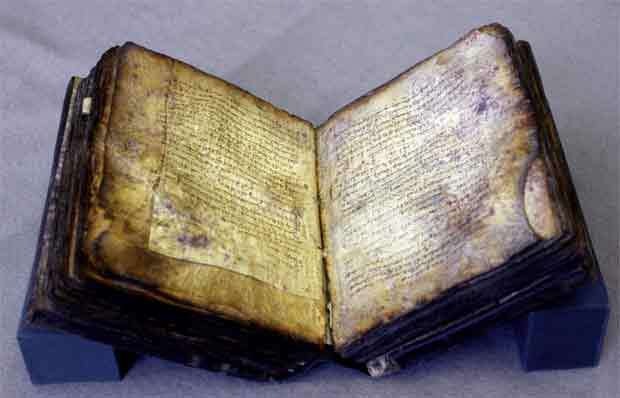 Parts of the codex were photographed by Johan Heiberg in the first decade of the 20th century. The Archimedes Palimpsest, a tenth-century manuscript that once belonged to the Greek Orthodox Patriarchate of Jerusalem, entered the collection of a French civil servant sometime in the 1920s under unknown circumstances. In 1998, the civil servant’s heir, Anne Guersan, consigned the palimpsest for sale at Christie’s auction house in New York. The Patriarchate brought suit to recover the work in Federal District Court, but its claim was defeated based both on the application of a French statute of limitations and on the principle of laches since it did not seek return of the work in a timely manner. The judge decided in favour of Christie's; and the codex was sold to an anonymous buyer for USD $2 million: "Simon Finch, who represented the anonymous buyer, stated that the buyer was 'a private American' who worked in 'the high-tech industry', but was not Bill Gates. (The German magazine Der Spiegel reported that the buyer is probably Jeff Bezos.)" Bezos is the founder and CEO of Amazon.com. Report on restoration of the codex. Video Source: Youtube. From 1999 to 2008, the codex was studied and conserved and digitized by experts at the Walters Art Museum in Baltimore, the Rochester Institute of Technology, and Stanford University. New imaging techniques found another text in the palimpsest by Alexander of Aphrodisias and confirmed yet another text in the palimpsest by Hypereides. You can see a description of the codex's contents here. The saga completes: "On October 29, 2008, (the tenth anniversary of the purchase of the palimpsest at auction) all data, including images and transcriptions, were hosted on the Digital Palimpsest Web Page for free use under a Creative Commons License, and processed images of the palimpsest in original page order were posted as a Google Book." The Archimedes Palimpsest. See more images of the codex, with its overlapping texts, here. The palimpsest project's site is here; you can read part of the Archimedes texts in the palimpsest, Geometrical Solutions Derived from Mechanics, in English translation here. You can look at the Archimedes Palimpsest on Google Books here. Imagine how different the history of the world would have been had the Alexandrian or Constantinople libraries' holdings been preserved! These are the ultimate unasked questions about lost information in an Age of Information: how do we know what we no longer know? And what kind of people would be if we knew what we have lost and forgotten?